2 women wanted for cashing forged checks at liquor store | Crime Stoppers of the Lowcountry: 554-1111 | 1-888-CRIME-SC | Anonymous tips earn cash rewards with Crime Stoppers of the Lowcountry. 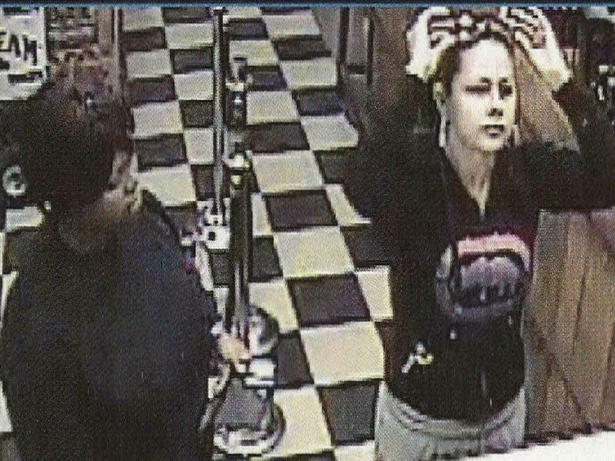 CHARLESTON, SC (WCSC) - Police have released images of two women wanted for cashing forged checks at a liquor store on Meeting Street. Charleston Police Department spokesman Charles Francis says that the women cashed two Wachovia checks at Burris Liquor on October 28. The first suspect is described as a black female with black hair standing approximately 5'8" and weighing about 225 pounds. Police say she appears to be in her twenties. 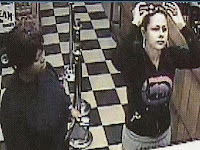 The second suspect is described as a white female with brown hair standing about 5'6" and weighing about 130 pounds. She also appears to be in her twenties, police said. If you have any information regarding these suspects, call Crime Stoppers at 554-1111.